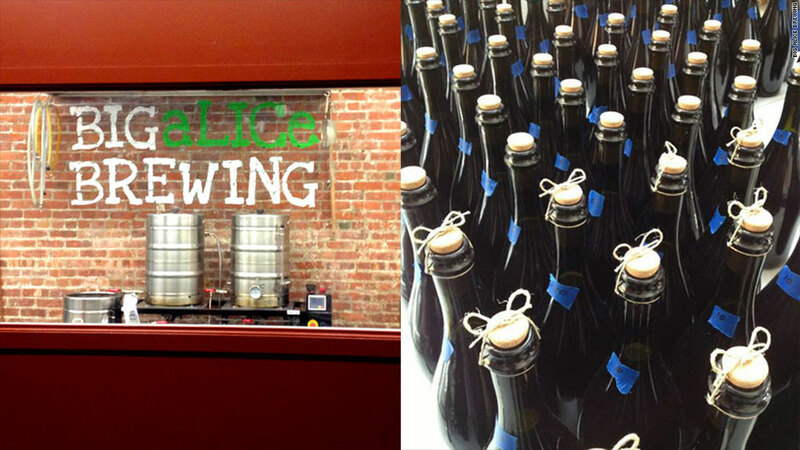 Big Alice Brewing is located in an old Bible warehouse in Queens, N.Y.; the bottles are all hand-corked with hemp ties. "Community-supported beer" doesn't just mean buying a pint at your local watering hole. For a growing number of upstart breweries, it's how they're getting their operations off the ground. Queens' Big Alice Brewing -- located in an old Bible warehouse near the water -- opened its doors in June and is selling beer shares as a way to finance the brewery. Inspired by the concept of community-supported agriculture, in which people buy directly from farmers, CSB subscribers pay $200 and receive two large bottles of beer each month for six months. Other breweries use different price points, time frames and methods of delivery, but the concept is the same: Buyers commit to a certain amount of beer for a certain amount of time, and the brewery gets guaranteed cash up front. Combined with more traditional methods of financing, it's an attractive way to solicit investment -- and get locals involved with the brewery. Big Alice's three cofounders initially invested about $35,000 to buy the equipment and convert the space, which they began work on in August 2012. They started brewing in January, and five months later had 20 batches of beer. The brewery used its first round of beer shares -- which started in July and runs through December -- to finance much of the raw materials like grain, yeast, bottles and corks. With flavors like salted caramel, purple potato trippel, and chamomile ale, subscribers were promised 12 different beers over the course of their share. Two-thirds of the first 90 shares went to friends and family and the remaining 30 were snapped up on the first day they were offered to the public. At Seattle's NW Peaks, Kevin Klein offers mountainBeers subscribers a 64-oz. growler for about $11 a month. The model provided roughly $10,000 in the first few months -- enough for supplies, rent and some additional equipment -- and also allowed NW Peaks to "brew to the number of subscribers," Klein said. "We could make sure that we had enough beer and enough product instead of killing ourselves to make more when we didn't need it." Chicago's Begyle Brewing started distributing kegs to local bars in October 2012, but the brewery's goal was always to sell directly to customers. They used "every facet of financing" to get off the ground, according to cofounder Kevin Cary. Investments from the three owners, friends and family, bank loans -- even a Kickstarter campaign to buy a specialized growler filler. With the $18,000 raised from Kickstarter, they hope to have the retail space up and running by mid-November. Once the space is operational, they'll launch their CSB, offering a certain number of growler fills a month for subscribers. "If we have 200 members all paying at once, that's a nice cash infusion," said Cary. "If we can handle more than 200 members, we can leverage that to secure a bank loan or another piece of equipment that will help us grow the brewery." That's how Big Alice sees its beer share program. Cofounder Scott Berger said they are already looking to expand their brewing system, which would offer 21 times the capacity they currently have. They'll need more investment and capital to actually buy the equipment, but he says they can use the next round of shares to buy the raw materials -- which will run about $5,000 per brew day, or $20,000 a month. Currently, the beer shares make up two-thirds of their sales (they sell the remaining bottles to the public on Friday evenings. But they plan to sell to local bars and restaurants, as well as specialty beer shops, with the expansion. They also hope that two of the founders (who are the brewers) will eventually be able to start to work at Big Alice full-time. But even as they grow, all three breweries plan to continue with the community-supported financing. "It's a way for our members to be a part of our growth," said Begyle's Cary. "It makes you part of the team in a way and you get to be there and watch the brewery grow."